Happy new year, everyone! I’m currently in Hong Kong visiting one of my best friends and overeating. On my return to London, my meals will mainly consist of salads and cooked vegetables. And this includes sprouts. I love winter vegetables and I’ve heard that this season’s crop of Brussels sprouts is supposed to be a bumper one. I picked up a whole stalk of them for about a pound at my farmers market before Christmas and had been eating them constantly. Rather than my usual method of roasting them, this year I’ve been shredding and then stir frying the little globes. This year seems to be all about slicing and dicing up sprouts: I encountered two recipes for them in the span of just a week. Jun Tanaka’s recipe mixed them with ham and pine nuts; Jamie Oliver’s was with bacon and lots of Worcester sauce. I preferred the former with its nutty pine nut bite, the latter being a bit too fruity to pair with other dishes, and here’s my take on it. recipe adapted from Jun Tanaka. Take a large handful of pine nuts and toast them in a hot frying pan, tossing often. Set aside. In the same frying pan over medium-low heat, add 2 tbsps of olive oil and throw in a whole smashed clove of garlic. Fry gently until the garlic is golden and then discard the clove. Toss in a handful of chopped pancetta and fry gently for a couple minutes. 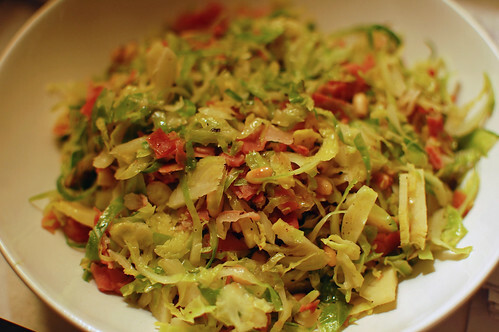 When the pancetta is cooked, turn up the heat and add a few large handfuls of sliced Brussels sprouts. Turn up the heat and stir fry for a couple minutes – if brown spots appear on the cabbage, then all the better! Add a little water and cover the pan and cook until the sprouts are as soft as you like. Uncover and let the water cook off. Add salt and pepper to taste, mix in the pine nuts and serve. The words “ready meals” suffer a bit of a stigma over here as one initially pictures the sad sweating plastic wrapped packets on the supermarket chilled shelves, ready for a nuking in the microwave. But the ready meals I’ve come across in Barcelona were always wonderful – freshly made croquetes, roasted chicken parts and meat stews, cooked legumes, and trays of prepared canalons ready for a cooking in the oven. Needless to say, you can pick all these up and more at one of the many fabulous markets scattered throughout the city. This is what London is missing! 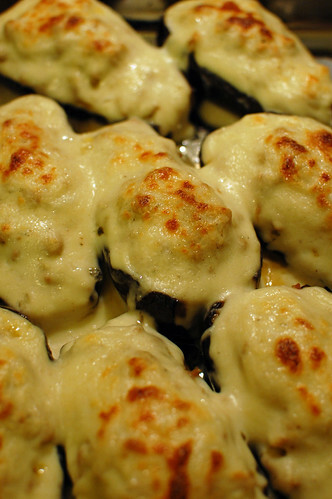 Anyway, what I wanted to really talk about was what I recently encountered on my last trip there – stuffed aubergines. 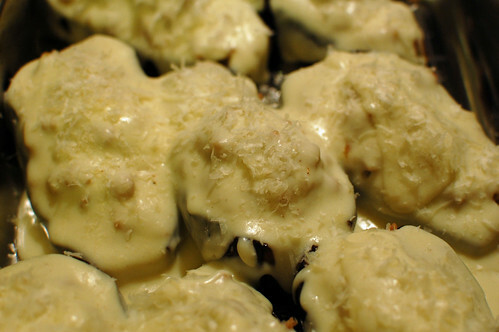 I saw trays of them ready for the oven – halved aubergines (usually the slim kind rather than the large bulbous ones) stuffed with a meat mixture and slathered in a rich bechamel. They looked fantastic and though I never tasted them, I knew I wanted to recreate something like that at home. But aubergines are not the only vegetable that’s filled; if you take a look at Colman Andrew’s fabulous book Catalan Cuisine, he has a whole section on stuffed vegetables. It turned out to be quite straightforward – all the components can be cooked ahead of time and put together well before they need to be baked. The meaty filling was so flavourful with the onion and tomatoes cooked down until they were melting together in their sofregit; the silky aubergines, though quite lovely by themselves, were really just carriers for the meat! The bechamel was luxuriously rich and I dolloped it on with a generous hand – the recipe below does make quite a lot. The only things I’d change next time is to try the thinner Japanese aubergines and to be more generous with the Parmesan cheese on top! Prepare your aubergines. Cut each in half lengthwise and scoop out the insides leaving at least a centimetre of flesh (I tossed the insides as mine had a lot of seeds). Arrange cut side up on a baking tray and brush liberally with olive oil. Roast in a hot oven until tender and set aside while you prepare the rest of the ingredients. Prepare your filling. First we’ll make a sofregit of the onions, garlic and tomatoes. In a frying pan, heat the oil over low heat and add the finely chopped onion. This has to cook until the onions have become soft and golden – this will take at least 15 minutes on a low temperature. When the onions are close to this, you can add the minced garlic and continue cooking until the onions are cooked and the garlic has lost its rawness. In the meantime, prepare your tomatoes – cut each in half around its equator and deseed them. Use your palm to push each cut half against a box grater and grate the tomato pulp, leaving behind the skins. Add this tomato pulp when the onions are golden and continue cooking over low heat until the tomatoes have melted into the onions and its redness is darker. That’s your sofregit. Add the minced pork and fry, stirring frequently so that the pork is crumbly, until the pork is all cooked (about 10 minutes). Add the thyme and nutmeg and season well with salt and pepper. Stir again and then turn off the heat. In a bowl, beat the egg and add the breadcrumbs to this. Stir together and then add this mixture to the pan with the pork. Stir to incorporate and there’s your filling. Make the bechamel. In a heavy bottomed pan, melt the butter over low heat. Add the flour and whisk together until incorporated. Let cook for about 3-4 minutes, whisking from time to time. Pour in the milk about a quarter of the volume at a time (you could whack in the whole thing but then it always seems to take longer). Whisk very well after each milk incorporation and then continue adding once the mixture gets thick. After all the milk has been added, continue cooking over low heat and whisking often until the bechamel is thick. Season with salt, freshly ground black pepper and a little freshly ground nutmeg, give it a final whisking and turn off the heat. Put it together. Preheat your oven to 200 degrees Celsius. 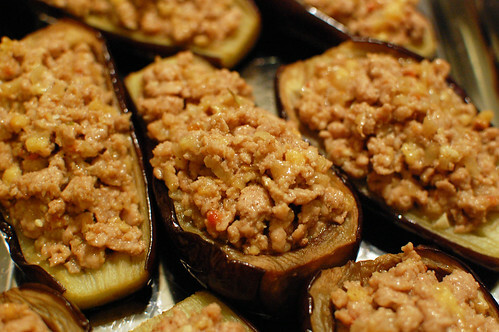 Lay your roasted aubergine halves in a baking dish and fill them with the pork mixture. Really stuff them well – use all that filling up! Top each filled aubergine half with a good couple of spoonfuls of bechamel and then sprinkle with some finely grated parmesan cheese. Bake in the oven for about 15-20 minutes – the filling should be cooked through (that egg) and the tops should be golden brown. 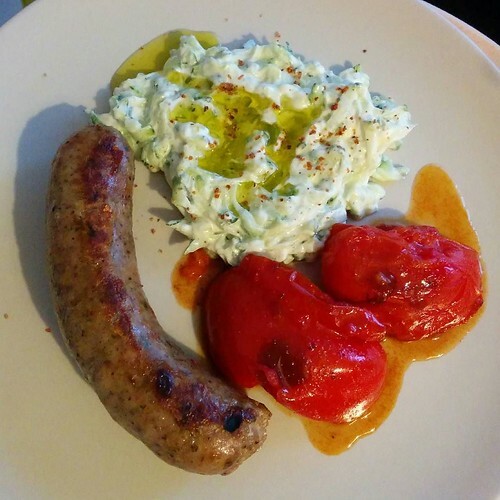 Serve with a salad and bread on the side. 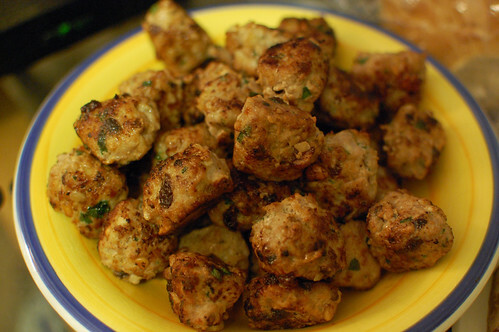 I came home last week craving meatballs; in particular, I wanted meatballs with toasted pinenuts and the sweetness of raisins – just like in the recipe by Molly from Orangette, whose recipes have always been dependable. Instead of turkey, I used pork and I also substituted flat leaf parsley for the coriander; they’re very customisable. I highly recommend making them – they’re juicy and meaty and yet have the nuts and raisins to keep them interesting. The result? 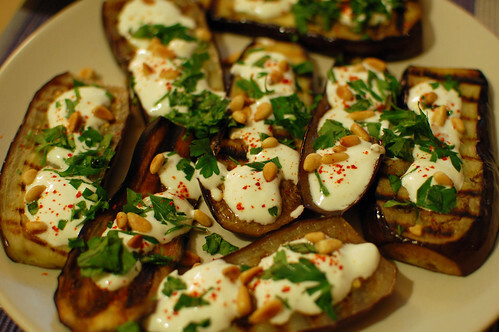 A great vegetable side dish – the tang of the yogurt and lemon goes so well with the neutral aubergines and gosh, I love pinenuts. I do wish I had doubled the recipe though but for normal people who expect normal portion sizes, this recipe will do! Slice each aubergine lengthwise into 4 slices (each slice will be between 1-2cm thick). Brush one side of each slice liberally with olive oil, sprinkled with salt and pepper, and slap onto a hot grill pan. Cook each side for about 5 minutes, brush liberally with oil again and flip and continue cooking. They should be soft when fully cooked – at this point, remove them onto a plate and continue cooking the rest of the slices. Crush the garlic clove into the yogurt and stir in the lemon juice too. Add a good pinch or two of ground cumin and season well with salt and pepper. Stir again and adjust the seasonings if desired. Dollop the yogurt on the aubergine slices – you may not use all the sauce and it’s great on the meatballs (should you decide to make them!). Chop the parsley and sprinkle that and the toasted pinenuts on top. Sprinkle with Piment d’Espelette or pimentón and serve. Okra! The vegetable, which also goes by the name of ladies fingers, may either induce feelings of love or hate in you. The lovers will probably adore its flavour and the slightly crunchy, popping texture of the large white seeds. The haters probably gag at the thought of okra’s mucilaginous texture when cut. I reckon this recipe might convert some of you haters. I mean, it’s deep fried; that’s worth a few points at least. I adore okra. I love it in fish curry and I love it stir fried with sambal. I eat it cooked in tomato sauce and I love it sliced thinly and deep fried into crisps. One day, I even want to grow it at home as it’s a cute plant: the pointy finger pods grow upwards. 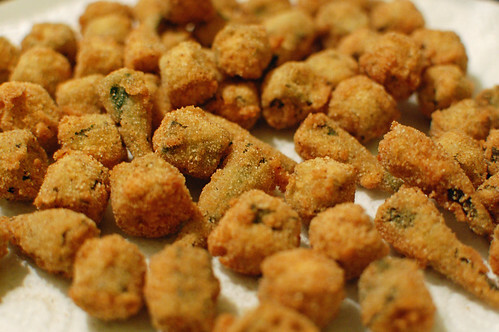 However, I’d never had Southern fried okra, where the pods are cut up and coated in a cornmeal crust and then deep fried. After frying some aubergines to make Reiko‘s noodles at home, there was still enough oil to deep fry a little something on the side. Southern-style okra had been on my to-cook list for a while and okra it was going to be. Putting it together was very easy and preparing and frying it all took no longer than 10-15 minutes. And what a crunch they had! We couldn’t stop popping the little fritters and cleared the small bowlful in no time. They weren’t slimy at all. The recipe below is for the small batch that I fried up for the two of us as a side dish. However, I wish I’d cooked ten times as much. The recipe is easily doubled, tripled, quadrupled, etc. but I think you’d only need 1 egg for every 20 okra pods or so. Many recipes online also add some buttermilk to the egg, which I’ll try next time. serves 1-2 as a side or snack. This one’s an easy recipe! Clean your okra and slice them into approximately 1.5cm chunks. Beat the egg and dump all the okra pieces into the bowl with it. Stir well so that each okra bit is coated well. In another bowl, add some cornmeal and season it well with salt and pepper (I reckon pimenton or chilli powder would be lovely here too). Use a fork to transfer the okra lumps to the cornmeal (you just want enough egg to hold that cornmeal on). Coat each lump well and set aside – they’re ready for frying. Heat some oil for deep frying – it should be ready when a piece of okra sizzles happily in there. Fry in small batches, turning occasionally, until they are golden brown. Drain on kitchen paper and serve. The National Trust were having a Heritage Open Day on Saturday, 12 September and we took the opportunity to visit Osterley House, set in Osterley Park. We’d both been to the park but had never set foot inside the house and we were pleasantly surprised to thoroughly enjoy our visit – perhaps we’ll take visitors there next time. The surrounding park is huge and consists of not only the manicured gardens but also working farms (we always take the time to pat the horses). The existence of these farms also results in a farm shop filled with lots of magnificent fresh produce, located near the parking lot. With pinenuts and raisins at home, I knew what I’d do with our new treasure. With the leaves, I made a Catalan Style dish to go alongside a tortilla I made with the colourful stems. It’s not necessary to separate the stems when making this dish though – I just liked the idea of a full Swiss chard dinner! Anyway, this makes for a lovely vegetable side dish, with the sweetness of the raisins and nuttiness from the pine nuts complimenting the greenery. 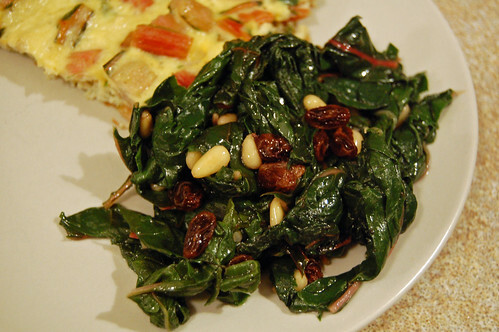 Spinach is a good substitute for the chard, but use lots as it shrinks more. Soak the raisins in hot water for 10 minutes. Drain and set aside. 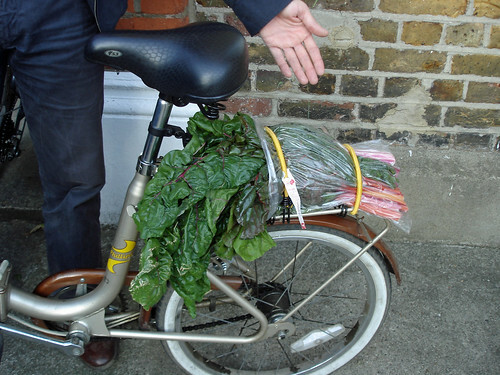 Wash your Swiss chard and cut the thick stems from the leaves. You can either save the stems for another dish or slice them and boil them and add them later with the boiled leaves (the stems take longer to boil). Chop the leaves into smaller pieces and blanch them in boiling water until tender (you may need to do this in batches). Drain, squeezing out the water, and set aside. In a large saute pan, heat the olive oil over medium heat. Add the pinenuts and soaked raisins and saute for a couple of minutes. Add the garlic and continue sauteing until the garlic is fragrant. Add the cooked Swiss chard and continue sauteing for another couple minutes. Salt and pepper to taste and then serve.